Far out in rural, Southern France, nestled near the Vallon-Pont-d’Arc commune, dark, infamous and sealed from the public eye, lies the haunting Chauvet Cave. Lining its walls, a series of cave paintings, unlike anything a Flintstone might sketch – no stick figures or scratchings to be seen. Rather, hundreds of detailed images in black and red ochre, depicting scores of creatures, stampeding, fighting and hunting – mammoths, horses, cattle, lions, hyenas, bears and rhinos, together in vivid, dynamic concord. The paintings are 30,000 years old; just beneath them are perhaps the oldest sets of footprints we know of – those of a small child, 27,000 years ago. 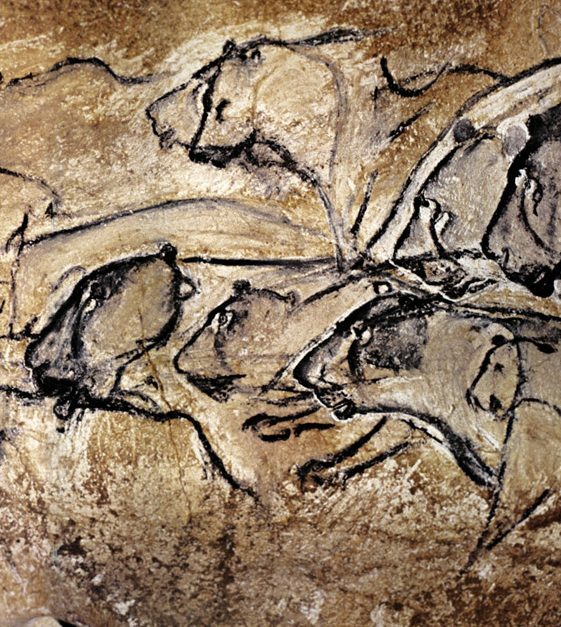 When first I saw the Chauvet paintings, something in my worldview took a knock. The moment I admired them, I knew that their artists were human – indisputably human – and whatever I thought that meant, my mind grew to accommodate them in my family, despite their countless differences. Similar feelings of connectedness struck me when I first read about neolithic tombs; bones aside tools and pots, preparing the dead for something hereafter. Closer to modernity, I wondered at ancient scrolls, poetry and musical instruments. Why was it that, when looking at ancient wolf-scratchings or horse fossils, I found myself so much less fascinated than I was by these tombs, paintings and lyrics? Humanity, humanness – that’s what makes those things so remarkable. But what do these tombs and paintings represent? What do they show about the humans who left them behind? Intellect, perhaps, but something about that idea seems lacking. Intellect might well stop a hunter-gatherer drawing, when there is food to forage and rest to get. It is precisely because the paintings and tombs seem so unnecessary that they tell us so much about their creators’ characters. Interest, then, might be a better answer, but more than basic desire or curiosity – it is passion, or worship. And this indeed is distinctly human. We are always and forever worshippers of things – beyond day-to-day necessity, or perhaps driven by necessity of a different kind. We relate to the Chauvet artists because they glorified what was beautiful, just because it was beautiful; because they had desires that extended past their bellies and babies, into something that preceded and surpassed their own lives; because they grasped at a significance that goes beyond their needs. And the modern human is no different. We make films, music and poems to glorify the things we find beautiful or worthy; we devote our resources to them, we make sacrifices for them – importantly, we build our institutions around them. For this reason, I find it strange when ‘the separation of politics and religion’ finds a voice amongst an electorate. Religion is a proposal of something to worship – and everyone worships something. Politics expresses not only what we need, but what we worship. What do we allocate to the arts? Do we prioritise family or individuality? Do we bolster the military, save the environment, protect animals, or increase foreign aid? Do we encourage a national identity, or a cosmopolitan one? Are we closed or open? The question of whether a state is religious or secular, then, is not a question of whether there is something explicit which the people claim to worship. It is an assertion that the state worships something other than the God of recognised world religion. To liberate the state from the shackles of religious politics is not to free it from worship or allegiance or identity, but to disqualify a particular category of gods and idols. Worship is passion, glorification, and above all sacrifice. It is first symbolised by a person in awe, then a person on their knees, but finally a person bringing and giving the best of what they have and make, and doing so with a joy in their eyes, as though nothing could be more worthwhile. We truly worship what we devote ourselves to. We worship above all that for which we would give up everything else. Almost anything then, can be an object of worship. He’s right – this seems silly. So how then do we pick? Amongst all the candidates for human worship and adoration, how should we decide which merit our utmost attention and wholehearted pursuit? Grasping and scrambling for objects of worship, humans throughout history have used many criteria. They have worshipped the most beautiful things they could see, in the hopes of obtaining more beauty. They have worshipped the most terrible things they could see, in the hopes of appeasing wrath. They have worshipped that which they thought had been around longest, or would be around forever. They have worshipped that which they thought would give them food, drink, children or victory in war. They have worshipped that which they hoped would give them redemption, salvation, life – immortality. Many of these hopes have been entirely empty. Worshipful civilisations have been washed away time and time again. Idols have killed their worshippers, and worshippers have abandoned their idols. The romance of worship in history has been fleeting, disappointing – and in politics today, we see the same. “I see in Lycurgus, Numa and Mohammed only legislators who, having the first rank in the state, have sought the best solution of the social problem but I see nothing there which reveals divinity…nothing announces them divine. On the contrary, there are numerous resemblances between them and myself, foibles and errors which ally them to me and to humanity. His birth and the history of His life; the profundity of His doctrine, which grapples the mightiest difficulties, and which is, of those difficulties, the most admirable solution; His Gospel, His apparition, His empire, His march across the ages and the realms, is for me a prodigy, a mystery insoluble, which plunges me into a reverence which I cannot escape, a mystery which is there before my eyes, mystery which I cannot deny or explain. Here I see nothing human. The nearer I approach, the more carefully I examine, everything is above me, everything remains grand—and of a grandeur which overpowers. Well then, I will tell you. Alexander, Caesar, Charlemagne and I myself have founded great empires; but upon what did these creations of our genius depend? Upon force. Jesus alone founded His empire upon love, and to this very day millions will die for Him. . . . I think I understand something of human nature; and I tell you, all these were men, and I am a man; none else is like Him: Jesus Christ was more than a man. . . . I have inspired multitudes with such an enthusiastic devotion that they would have died for me . . . but to do this is was necessary that I should be visibly present with the electric influence of my looks, my words, of my voice. When I saw men and spoke to them, I lightened up the flame of self-devotion in their hearts. . . . Christ alone has succeeded in so raising the mind of man toward the unseen, that it becomes insensible to the barriers of time and space. Across a chasm of eighteen hundred years, Jesus Christ makes a demand which is beyond all others difficult to satisfy; He asks for that which a philosopher may often seek in vain at the hands of his friends, or a father of his children, or a bride of her spouse, or a man of his brother. He asks for the human heart; He will have it entirely to Himself. He demands it unconditionally; and forthwith His demand is granted. Wonderful! In defiance of time and space, the soul of man, with all its powers and faculties, becomes an annexation to the empire of Christ. All who sincerely believe in Him, experience that remarkable, supernatural love toward Him. This phenomenon is unaccountable; it is altogether beyond the scope of man’s creative powers. Time, the great destroyer, is powerless to extinguish this sacred flame; time can neither exhaust its strength nor put a limit to its range. This is it, which strikes me most; I have often thought of it. This it is which proves to me quite convincingly the Divinity of Jesus Christ.